Training begins Monday, January 7, 2019 through March 25, 2019 (12 consecutive Mondays). Lectures begin promptly at 6:00 p.m. This training is intensive discipleship. It is learning to minister the Word of God to people where they need it the most right now. Everyone is a counselor to someone. Spouses, parents, teachers, pastors, youth workers, church leaders, and health care professionals are regularly giving advice about a variety of subjects. The counseling ministry of Wheelersburg Baptist Church is committed to the absolute sufficiency of the Word of God. 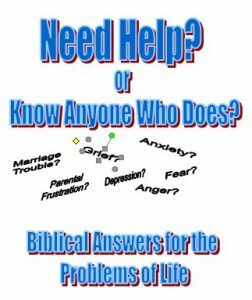 We believe that in the Bible God has provided us with real answers for the real problems people encounter in life. If a person came to you depressed, heavy with guilt, near a “breakdown,” anxious, fearful, full of bitterness, with marital problems, or overwhelmed with grief, would you know what to do according to God’s Word? The goal of this training is to equip God’s people to be able to minister God’s Word to those in need. If you want your counsel to be more biblical, insightful, and helpful to the people you care about, consider participating in this course. Pastor Brad Brandt: Certified counselor and fellow with the ACBC (Association of Certified Biblical Counselors) (formerly known as NANC). Pastor-Teacher at Wheelersburg Baptist Church since 1987. Barbara Miller: ACBC certified. Member and counselor at Wheelersburg Baptist Church. Nurse practitioner at a local OB/GYN office. David Beam: ACBC certified. Member, counselor and teacher at Wheelersburg Baptist Church. Dr. Charles Hodges, M.D. : ACBC certified. Addressing Medical Issues in Counseling during Medical Issues Night on March ___. The cost involved is for the handbook, supplies, reading materials for each class, and expenses for outside/adjunct instructors. Couples may share their books but will need to purchase their own copies of the training manual. If not all books are needed, you may purchase them individually by adding their cost(s) to your Registration and Manual fees. Scholarships may be available if cost prevents participation in the course. Call WBC for details. **Payment will be due the first class.